Leading Manufacturer of polymer industrial wheels from Ankleshwar. Shree Polymers is one of the quality assured manufacturers and exporters of Polymer industrial wheels such as trolley wheels etc. These wheels are polymerized and developed using top grade material, processes. During the production, a set of guidelines is followed. This has given us dividends since the beginning in the form of superlative quality of wheels. Injection molding process is used herein, which ensures good weatherability and hand feeling surfaces. The range of Polymer Industrial Wheels is widely used in almost all the industries as well as in daily household chores. The Polymer Trolley Wheels have standard range of load carrying capacity, which makes it ideal for use in various equipment/products. 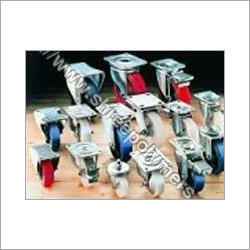 The entire ambit of castor wheels, rollers is offered in maximum size of 19" diameter. Depending on the demands of clients, we can apply coating or lining of PU / UHMWPE on our rollers and polymer wheels. Owing to customization support offered by us, we have achieved optimal customer satisfaction. These Polymer Industrial wheels or Polymer Trolley Wheels are majorly used in almost all kind of Industries & also into Day To Day uses in the houses too. Depending upon its Load Carrying Capacity size is decided & the type of Polymer Wheels is also dependent on the area of application. We manufacture Polymer Trolley Wheels & rollers of size max. upto 19" Dia. Our specialty lies in coatings/lining of UHMWPE / PU on rollers & Polymer Wheels.